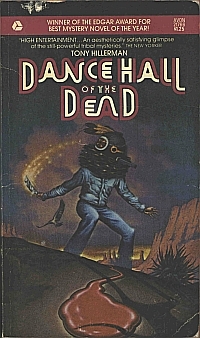 This is the first of two US paperback editions of Dance Hall of the Dead, although Avon released at least four different covers for four different publishing runs. A band at the top of the front cover notes that the book was the winner of the Edgar Award for Best Mystery Novel of the Year . A similar version of this cover was also released, with the band removed and the addition of a bright red cartouche at the top of the cover containing reference to the Edgar award and a blurb from the New York Times. The rest of the cover design remains identical for both covers and includes a fairly accurate depiction of a Salamobia [Zuni warrior kachina], as well as various sandstone monuments that evoke geologic formations in and around Zuni Pueblo. The jacket designer is not attributed. Binding: Paperback with full color illustration on cover.